Madison here. Mom’s letting me write today’s blog since I’m arranging our December 2008 ROAD TRIP. I guess that puts me in the driver’s seat. We’re heading down I-75 towards Jupiter, Floria starting on December 7th. We’ll be stopping at quilt guilds and quilt shops along the way so that Mom can earn gas money and kibble. Need a lecture? I can arrange that. I’ve got five tentative bookings so far and would like to fill four more. Anybody need a lecture and don’t mind a very quiet, well-behaved, semi-retired service dog joining your group for the evening? Email me. If you have any great dog-friendly spots off I-75 that we shouldn’t miss, let me know. UPDATE: Sadly this trip never happened. My mother took a turn for the worse and passed away in November. Entry filed under: Dog Stuff, Quilting News. Bagels	Piping Hot Twisted Sisters?! Madison – Looks like you are going to spend a lot of time backtracking if you are going to be in Atlanta on Dec. 8 and then go back north to either Knoxville or Chattanooga followed by going further north to Lexington. Maybe you better let a person with a map plan the itinerary — I know it is very hard for dogs to unfold maps because of the thumb thing. First we go south, then we go north. It’t the only way I could think of getting to Florida and then getting back home again: MI, KY, GA, FL then GA, TN, KY, OH, and MI. There is a wonderful dog park just off I-75 about 25 miles north of Cincinnati. It is in the old Voice of America radio park. Take the Tylersville Road exit and go east. The park is on the north side of Tylersville Road. Located in the historical 330 acre Voice of America Park (also home to several nice walking paths and the Daisaku Ikeda Tree Grove) is a 3 acre off-lead area that can accommodate large or small dogs. Dogs must be sociable and current on all vaccinations. Just saw that you’ll be on the road out our way this coming December. I’m a member of the Norris, TN quilt guild “Bits ‘n Pieces”. We have 33 members. I had the good fortune of hearing Ami when I lived in Dallas and would love for our gals here to have that opportunity. We are about 18 miles north of downtown Knoxville – 1 mile off of I-75 @ the Hwy. 61 (Clinton/Norris) exit. I have passed along your info to our President and she’ll get back with me. I have no idea what your fee would be for speaking…. would you please let me know? If we can’t afford it, perhaps the Knoxville quilt guild “Smoky Mountain Quilters” could host it and we could participate. There is a dog park in St. Augustine, near I-95. You get off on the second exit to St. A driving south. You drive to Wildwood and make a right, there is a chevron station on the corner, and drive to Treaty Park. 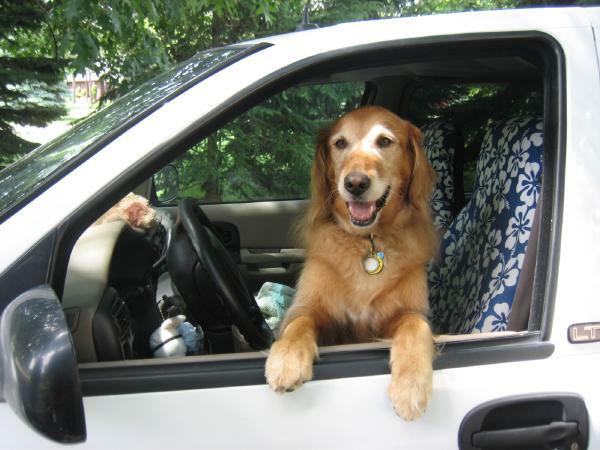 We’d be proud to have Madison relieve himself of the tensions of helping you drive at our dogpark. Are there no Florida lectures? I see you are stopping in Atlanta. Where will you be speaking, etc.? It’s too bad you won’t be coming to Texas. There’s a dog park near my house too. You are lucky that your Mom lets you blog. You must be good on the keyboard. I only get to sit under my Mom’s desk when she blogs about me. Woof Woof! Hi Madison and Ami-I am thrilled that you will be coming through GA. I will be checking back to see when and where I can see you speak in the Atlanta/Macon area. My main reason for writing to you is to open my home to you. I live 1 hour south of Atlanta and would love to have you stay with me on your way to FL. Let me know if I can be your B&B for a night. I am very dog friendly!! Madison, there is a dog beach!!! in Jupiter, FL. Lots of labs and Goldens (and the occasional very handsome Border Terrier). And tell your Mom that sand helps to keep needles sharp! This way she won’t be upset when she finds sand everywhere in the van. Keep that tail wagging and those needles flying!